In olden times Le Lauzet was the military seal on the Ubaye valley, In the course of its history it has been subjected to numerous invasions and its château (of which there remains some "feudal ruins") was destroyed during the religious wars. These days, Le Lauzet is a bright, colourful market town, enlivened by several café terraces, and enhanced with a charming little emerald green lake lined with willows. It is really very pleasant to stroll through its small shaded streets with their grey facades enlivened by red and green shutters. You will surely meet a dog or two, as well as an old woman sitting in front of the church of St Laurent (austere building with no embellishments), and you will be able to learn a thing or two on the theme of "a world of hunting and gathering" by visiting the Valley Museum, situated on the small church square. 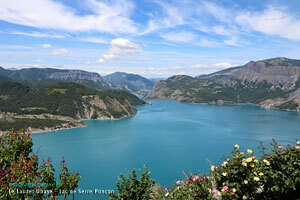 But Lauzet-Ubaye's main attraction is without doubt its lake, a marvel of nature which mirrors the surrounding high peaks. 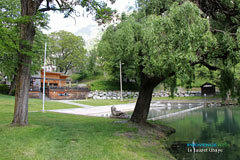 What a pleasure to bathe in its refreshing waters in summer, or try a pedal-boat or a kayak or do some fishing, before stretching out on its peaceful banks, in the shade of the willow trees. This is the place for white-water sports, rafting, white-water swimming, hot dogging and canoeing on the Ubaye river or for canyoning in the spectacular waterfalls of Costeplane. 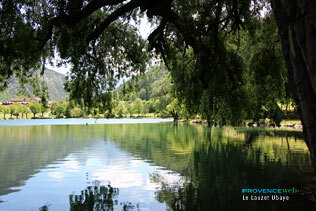 You will spend a refreshing summer at Lauzet-Ubaye ! The Roman bridge,a narrow defile 40 m above the Ubaye,a listed site dating from the 13th century. The Villard Dolmen, dating from prehistory and listed in 1900. The parish church dedicated to St Laurent. The sundial at la Lauze. White-water sports (raft, kayak, etc.). Water sports on the Serre-Ponçon lake lake (5 Km). In winter, cross-country skiing at St Jean-Montclar. 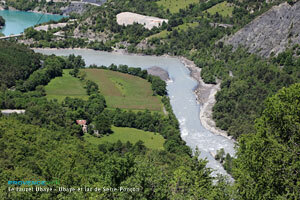 Hiking (la Gourette, the Col Bas lakes, Parual).